An eight-year-old startup that has survived hard times and a major pivot has set a new world-record goal for itself: making the world’s cheapest solar panels at $0.28 per watt, whether that’s in the U.S. or in China. The company’s name is Siva Power (originally founded with the name Solexant) and it says in another four years it could make these thin panels at that price at a 300 MW factory that it hopes to fund and build. It’s an ambitious target. Siva Power originally was looking to make thin-film solar panels by printing the material cadmium-telluride in the form of nanocrystals on to rolls of a flexible metal foil. But it — along with the dozens of other thin-film solar startups like Nanosolar, Solyndra and Miasole — faced tough times when the price of silicon (the key ingredient in traditional solar panels) dropped dramatically and Chinese companies flooded the market with cheap solar panels funded by low-cost government loans. 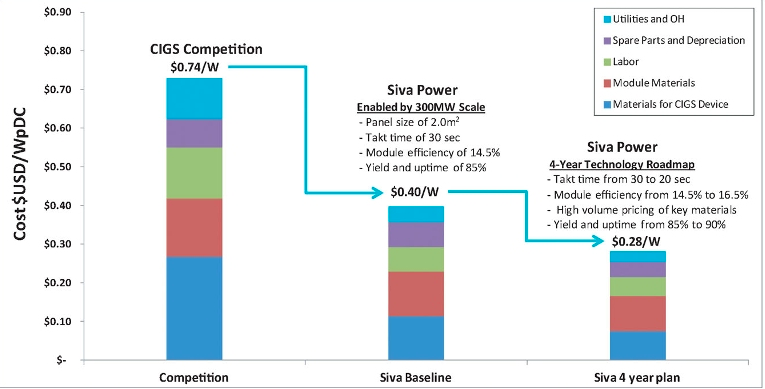 Siva Power’s roadmap to commercialization, image courtesy of Siva Power. As companies like Solyndra went bankrupt, the company — then known as Solexant — decided to begin pivoting and in 2011 hired current CEO Brad Mattson to lead a new direction. Mattson previously founded and led chip companies Novellus and Mattson Technology and was a partner focused on solar at venture firm VantagePoint Venture Partners. Now Siva Power is focused on making thin film solar panels out of the material combo copper, indium, gallium and selenium (CIGS), which is the same material that was under development by Nanosolar, Solyndra and Miasole. The company said it’s using the manufacturing technique co-evaporation to deposit the compound straight onto glass panels, which are then encapsulated. Other CIGS panels makers have mostly focused on depositing CIGS onto metal foils, which are then cut into strips, assembled on panels and encapsulated in glass. But to get to this $0.28 cost per watt point, Siva Power will have to build a 300 MW pilot factory, which is large for a pilot line for an emerging technology like CIGS panels. Japanese solar company Solar Frontier — part of Showa Shell — is one of the only companies making CIGS at scale and it has a 900 MW annual capacity factory. Siva Power thinks the 300 MW line can get it to $0.40 cents per watt, and another two years of efficiency tweaks could get it to below $0.30 per watt. Siva’s 300 MW factory could cost $100 million, which is a big sum for a startup, particularly a venture-backed startup in a market that has faced a lot of struggles. The issue with some of the early CIGS companies is that they spent a lot of money on factories before their technology was perfected for commercialization. While Siva Power was originally looking to scale straight up to this 300 MW line, it’s now using a $15 million funding round from the city of Wuxi in China to build a smaller pilot line first. Twenty eight cents per watt is cheap, to say the least. The Department of Energy is funding a solar program called SunShot, which is looking to push solar panels down to a price under $0.50 per watt by 2020. 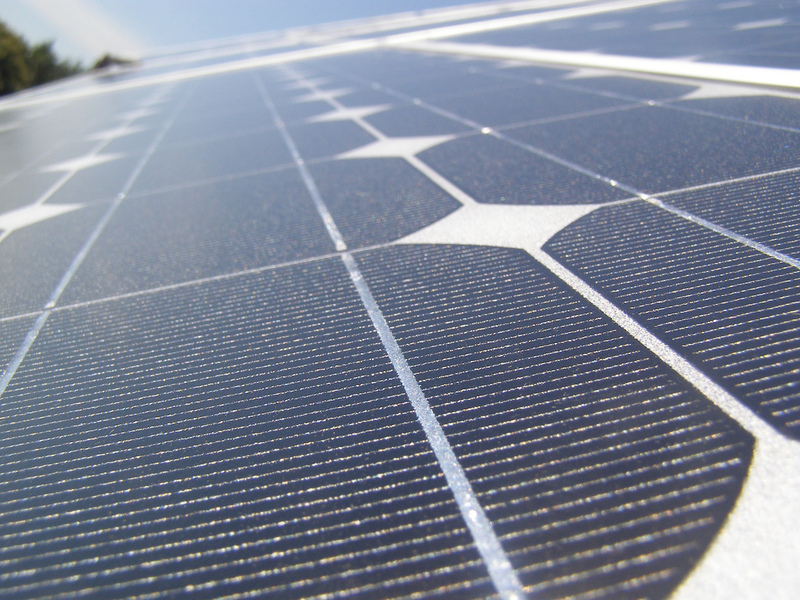 Other competitive thin film and CIGS companies can make solar panels for around $0.55 to $0.75 per watt. First Solar broke the under $1 per watt barrier in 2009. Featured photo courtesy Flickr user Marufish. Updated to reflect that the SunShot goal is for 2020, not 2030. I hear the need for tellurium in other pv cells has been an obstacle to lowering the cost, but it has been eliminated here and all the components appear inexpensive, which is a positive sign. Hi. What do you mean when you say it’s $0.28 per watt? What parameters were used to arrive at that figure? I’ll be purchasing this stock once it goes public. Mike said:”Thatâ€™s the beauty of private enterprise.” The question is this company is opening a small shop in China and transfer the technology China. In the article, it says Chinese government funded solar manufacturers flood the US market. I do not think America understand how China is take all the future technologies while we all think about private enterprise. So this is impressive stuff, but perhaps less than meets the eye? Jinko was below $.50 / watt at the end of 2014. Siva is basically claiming they can beat that nicely, but only four years from some date when they really get going. The 2017 forecast of 38 cents is basically a given, not based on some set of events that might happen. While it’s certainly true that silicon-based cells are hitting a point of slowing declines, it’s not clear 38 cents is an endpoint. And if some technique comes along that can even marginally improve efficiency, it’s distinctly possible that the price will push down toward 30 cents before the decade is out. With silicon. I’m quite sure that 30 cents is on the roadmap of any number of silicon producers that already have running plants, at scale, with high utilization. CIGS has been a gigantic disappointment. Let’s hope this isn’t more of the same. could u give me full details of the solar plants cost and how to use the solar system. @student, I don’t have much details beyond what’s written. If I get more, I’ll update it. Great idea, when are they coming to Canada? It would be nice but I’ll believe it when I see it. @Mike. a skeptic! but yes, they have ambitious plans for a startup. That’s the beauty of private enterprise. People put their own money into projects they believe will benefit others. And, we all benefit when they are successful. I’m pulling for them! This contrasts sharply with government-sponsored boondoggles such as Solyndra and Fisker cars and so many others. Hmmm, China is a state run economy and as the article mentioned part of Solyndra’s problem was competing with Chinese exports “funded” by the Chinese government. I don’t think government involvement in our economy is a bad thing or that they are all “boondoggles”. Maybe we aren’t doing enough “boondoggles”. Without NASA and the push from Kennedy to make it to the Moon who knows when we’d have had transistors which led to smaller and smaller computing and electronic devices. That old saw is getting mighty dull. There might be a couple of successes for government economic planner but darn few. NASA is one government sponsored enterprise that has had little recent success. The internet wouldn’t exist without DARPA funding ARPANET, and I wouldn’t be leaving a comment here if not for Government funding that. Just because it is government sponsored does not for a boondoggle make. History has plenty of “free enterprise” “b boondoggles too.Any new technology is a risky enterprise. That is its nature.